The Cyprus dwarf elephant (Palaeoloxodon cypriotes) is an extinct species of elephant related to the living Asian elephant. 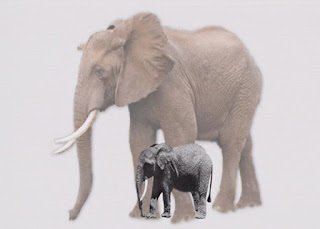 It was among the only mammals on Cyprus before humans arrived, and it is thought the Cyprus dwarf elephant came to the island during the last Ice Age. This species was only about one meter in height and is a case of 'insular dwarfism'. The factors responsible for the dwarfing of island mammals are thought to include the reduction in available food, a reduction or even absence of predation and competition. The Cyprus dwarf elephant became extinct around 11,000 BC. Believed to be descended from the straight-tusked elephant, this much smaller species inhabited Cyprus. Closely related species roamed some other Mediterranean islands. Remains of the Maltese dwarf elephant (Palaeoloxodon falconeri) were found on Sicily and Malta (at Għar Dalam, pronounced 'ar dàlam' in Maltese and meaning 'Cave of Darkness'), while those of the Cretan dwarf elephant (Palaeoloxodon chaniensi) were found in Stylos and in the Vamos cave, near Chania, western Crete. The estimated body weight of the Cyprus dwarf elephant was only some 200 kilogrammes, a staggering weight reduction of about 98% from its ancestors which weighed about 10 tonnes or more. Their molars however were about just 40% of the size of the mainland straight-tusked elephants. 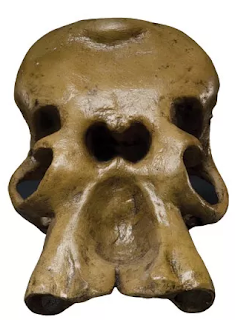 Remains of the first Cyprus dwarf elephant were first discovered by British palaeontologist Dorothea Bate (1878–1951) in 1902. She found the fossilized bones of the elephant in a cave in the Kyrenia hills of Cyprus. Human interference leading to the extinction to the Cyprus dwarf elephant has been a controversial topic over the last couple of decades. A rising theory is that most of the elephants died during the settlement of the Mediterranean islands. A claim to support this theory is that the early Greek settlers thousands of years later incorporated the dwarf elephant into their mythology calling them Cyclopses (one-eyed monsters). An alternative theory is that these early Greeks found a skull of an extinct Cyprus dwarf elephant and, not knowing that it belonged to an extinct elephant, thought it must belong to a mythical figure because the central nasal cavity - where the trunk was attached - could easily have been mistaken for a single eye socket. Massetti: Did endemic dwarf elephants survive on Mediterranean islands up to protohistorical times? See here.